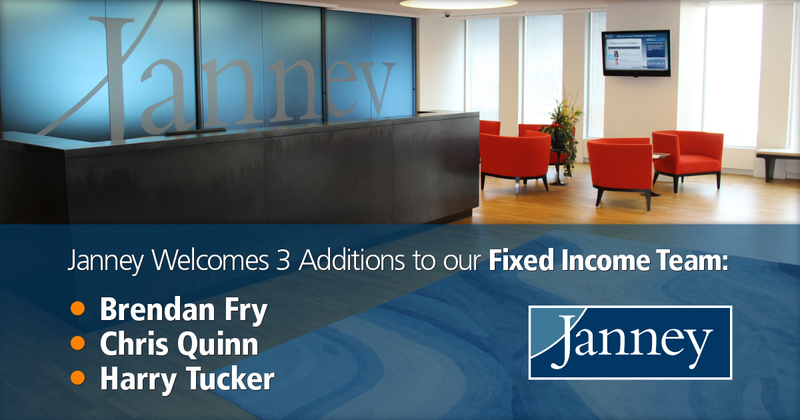 PHILADELPHIA, PA – March 14, 2016 – Janney Montgomery Scott announced today the addition of three fixed income professionals. Brendan Fry, Chris Quinn and Harry Tucker have all joined the firm. Brendan Fry, Director, Fixed Income Sales - Brendan joined Janney from GK Baum. Brendan will serve as a Director in our Securitized Sales Group. Brendan brings a highly successful career history along with valuable securitized product knowledge to the Janney platform. Brendan will be based out of Janney’s Frederick, MD office. Chris Quinn, Fixed Income Sales Associate - Chris joined Janney from Cantor Fitzgerald. Before joining Cantor, Chris began his career at Morgan Stanley Smith Barney as a trading assistant. Chris is a graduate of the University of Scranton, Kania School of Management. Chris will serve as a Sales Associate in Janney’s Credit Sales Unit out of Janney’s Midtown, NY office. Harry Tucker, Director, Fixed Income Sales - Harry joined Janney from Guggenheim Securities in New York as a Director in High Yield Sales. Before joining Guggenheim, Harry was with Miller, Tabak and RW Baird. Harry brings valuable, long-term expertise in the High Yield and Distressed markets to the Janney platform. Harry will be based out of Janney’s Midtown, NY office.